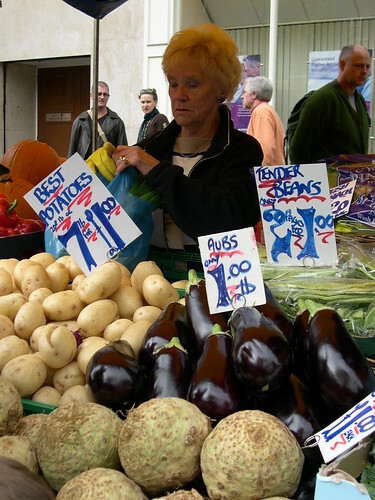 St Albans Market, originally uploaded by mike1727. St Albans is a small mediaval city, just North of London. If I was an American tourist I'd probably call it 'quaint'- there's a load of Roman remains, a nice cathedral, a vibrant market, loads of restaurants and pubs. The city is compact- you can ride from one side to the other in an easy 15 minutes- and surrounded by greenbelt. Like all settlements in the South-East, St Albans is under intense housing pressure, and although not totally gridlocked just yet we've got traffic problems most of the time. Megaretailer Tesco would like to build a superstore on a brownfield site just outside the city centre. Tesco have been buying up property around the site for some time as part of its landbank strategy and letting the houses and shops it owns on this main road into the city fall into disrepair in order to make redevelopment more attractive. Finally, they've made a planning application for a combined superstore and housing project- read more about it on their greenwash-spattered site here (if the massive spin doesn't make you dizzy), then read just some of the local reactions on the plan at the local protest group here and St Albans Green Party here. A superstore this close to town threatens local businesses including our 1,000 year old market. The site can be better used: situated very close to the station and the city centre it's a prime spot for housing and shouldn't have so much area dedicated to retail. Additional traffic generated by shoppers and deliveries will worsen queues and reduce safety for cyclists. Boycott Tesco other supermarkets are available, or try the market for cheaper fruit and veg without excessive packaging and with less food miles. 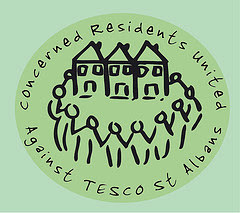 Tell Tesco why they're not welcome here Use Tesco's 'contact us' page here , or if you're a Tesco shareholder try here.